The British Martin-Baker MB 5 was the ultimate development of a series of prototype fighter aircraft built during the Second World War. Neither the MB 5 nor its predecessors ever entered production, despite what test pilots described as excellent performance. Martin-Baker Aircraft actually began the MB 5 as the second Martin-Baker MB 3 prototype, designed to Air Ministry Specification F.18/39 for an agile, sturdy Royal Air Force fighter, able to fly faster than 400 mph. 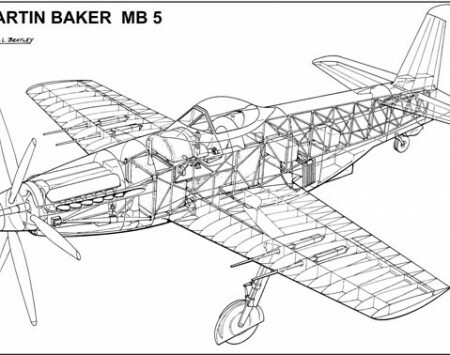 After the first MB 3 crashed in 1942, killing Val Baker, the second prototype was delayed. A modified MB 3 with a Rolls-Royce Griffon was planned as the MB 4, but a full redesign was chosen instead. 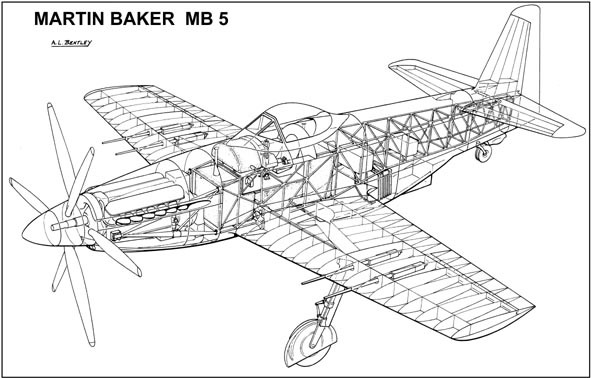 The re-designed aircraft, designated MB 5, used wings similar to the MB 3, but had an entirely new steel-tube fuselage. Power came from a Rolls-Royce Griffon 83 liquid-cooled V-12 engine, producing 2,340 hp (1,745 kW) and driving two three-bladed contra-rotating propellers. Armament was four 20 mm Hispano cannon, mounted in the wings outboard of the widely spaced retractable undercarriage. It was built under the same contract that covered the building of the MB.3.